Most of the Universe is dark. The protons, neutrons and electrons that make up the stars, planets and us represent only a small fraction of the mass and energy of the Universe. The rest is dark and mysterious. X-rays can help reveal the secrets of this darkness. X-ray astrophysics is crucial to our understanding not only of the Universe we see, but the quest to determine the physics of everything. At the close of the 20th century, our perception of the Universe was jolted. Instead of slowing down after the Big Bang, the expansion of the Universe was found to be accelerating. Was the cosmic acceleration due to Einstein's cosmological constant, a mysterious form of "dark energy," or perhaps a lack of understanding of gravity? The answer is still out there. By studying clusters of galaxies, X-ray astronomy is tackling this question using powerful techniques that are independent of other methods currently being employed or proposed for the future. 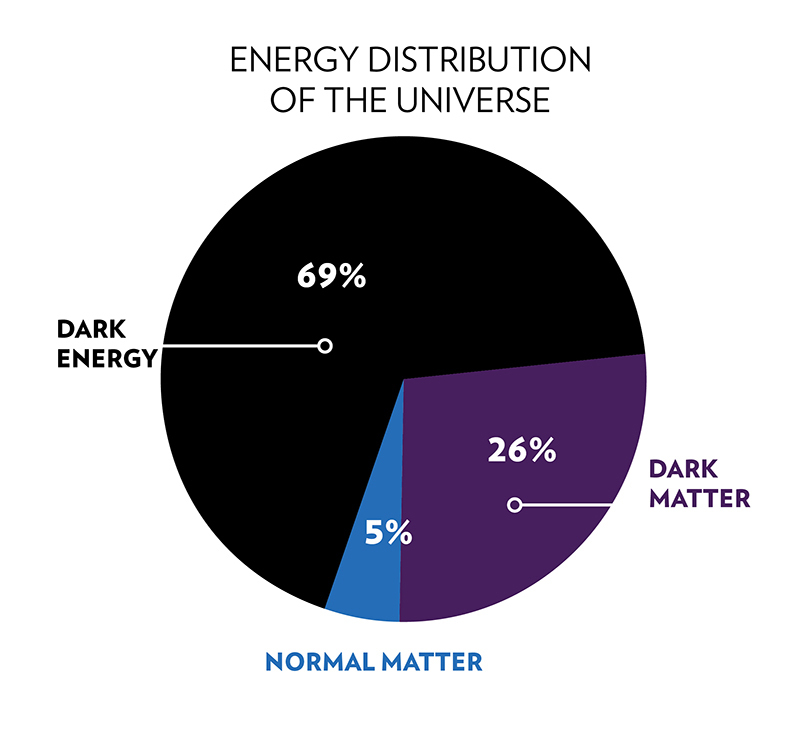 The next chunk of the Universe's budget is another unknown: dark matter. Of all of the material we know about because we can see its gravitational effects, about 85% is composed of matter that emits no light and is radically different from material found in planets and stars. X-rays can be used to study the effects of dark matter in a variety of astronomical settings, and thus probe the nature of this mysterious substance that pervades the Universe. Our small piece of the pie is the remaining 4% of the Universe containing everything we can see with our eyes and telescopes. This includes all intergalactic and interstellar gas and dust, stars, planets, and life. Before dark matter was discovered in the 1930s, this 4% was our entire Universe. Scientists now use their telescopes and computers to learn ever more about the exciting objects and phenomena in the observable cosmos, but also to glimpse through keyholes into the much larger Dark Universe. Supernovas are produced when stars end their lives in spectacular explosions so bright that they outshine their home galaxies. During their lives, stars convert hydrogen and helium into heavier, more complex elements, which are distributed into space when the star explodes. Nearly everything on Earth, including life, owes its start to the demise of earlier generations of stars that went supernova. The remnants of supernovas can glow in X-ray light for thousands of years, and reveal their secrets to sensitive X-ray telescopes. Galaxy clusters are the largest structures in the Universe that are held together by gravity. These mammoth objects can contain thousands of individual galaxies, are immersed in vast clouds of hot gas, and are held together by immense amounts of dark matter. The hot gas, which radiates at temperatures detectable by X-ray satellites like Chandra, contains much more mass than the galaxies themselves. Their size and mass, along with their rich reserves of dark matter, make galaxy clusters valuable cosmic laboratories for the study of the properties of the whole Universe. Astronomers have known for some time that about half of all of the baryonic matter, a.k.a. protons and neutrons, in the recent, nearby Universe is unaccounted for. It's all there in the early Universe, so where did it go? One idea is that these missing baryons became part of an extremely diffuse weblike system of gas clouds from which galaxies and clusters of galaxies formed. One of the best ways to detect these missing baryons is through their faint, but observable, X-ray signatures. Astronomers use every appropriate means at their disposal to investigate the biggest questions in the Universe. In the past decade, Chandra has demonstrated that X-rays Our Universe are a fundamental part of the modern astronomer's toolkit. Many wavelengths. One Universe. Are We Living in a Jelly Bean Universe? 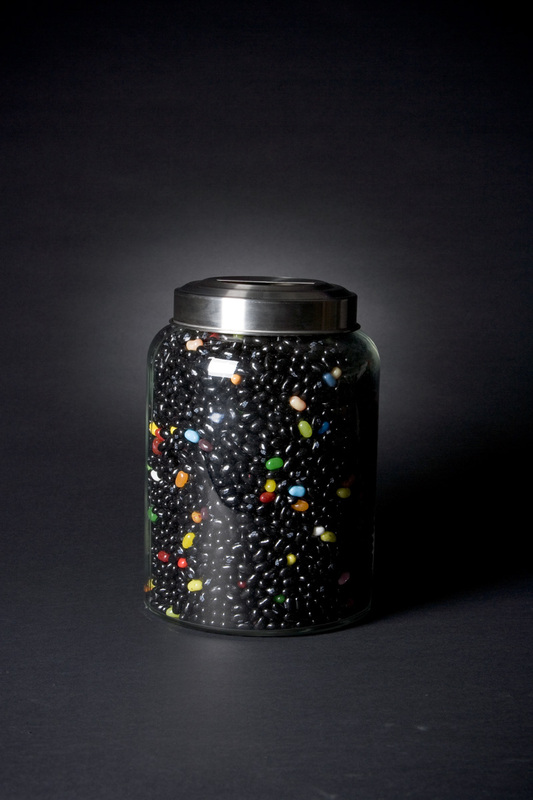 Like the jelly beans in this jar, the Universe is mostly dark: 96 percent consists of dark energy (about 70%) and dark matter (about 26%). Only about four percent (the same proportion as the lightly colored jelly beans) of the Universe- including the stars, planets and us- is made of familiar atomic matter. How Many Jelly Beans Fill A One-Liter Container? How big is a jelly bean? A typical jelly bean would measure about 2 cm long by about 1.5 cm in diameter. Do jelly beans completely fill the container? The irregular shape of jelly beans result in them not being tightly packed; approximately 80% of the volume of the bottle is filled. The number of jelly beans is the occupied volume of the container divided by the volume of a single jelly bean. The volume of one jelly bean is approximated by the volume of a small cylinder 2 cm long and 1.5 cm in diameter.